I first made pesto a few summers ago. I see a lot of recipes for this sauce, dip or salad dressing. Honestly, I am not sure what to call it because we use it for everything. You can see in the picture above we tossed it with some pasta. I also use it served with fresh veggies, over eggs, thinned down for a salad dressing and as a marinade for chicken or kabobs. Basil is in my top five for fresh herbs. I buy this herb more than any other herb all year round. My neighbor can grow it like he is a super farmer. Me? Not so much. I use the same technique and I get nothing. Nada. My brown thumbs may never turn green at this rate but I keep trying each year hoping for the same results. For this reason I buy basil instead of growing it myself. Pesto is a party in my mouth. The freshness that is present is undeniable. The flavors linger long after my meal is over. Much to my delight. I know this version is not traditional but it is what I like. I prefer the flavor of cashews to almonds or pinenuts. I am pretty sure that I burned my taste buds out on almond flour, almond nuts and anything that looks or feels like an almond. Blech...I needed a break from that healthy nut. 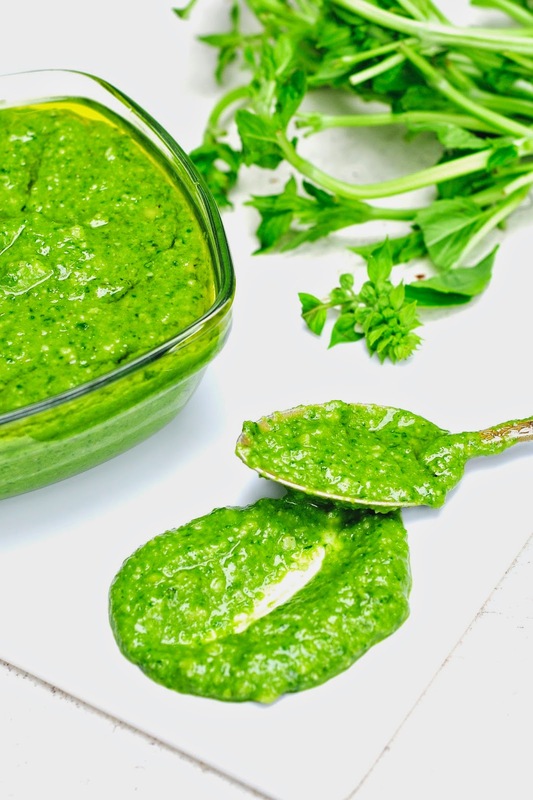 Cashew is a great replacement in pesto. Using fresh ingredients is the way to go but also using a good quality olive oil is key too. I have tried plenty of icky tasting olive oils to last a life time. I now invest in what I think is a great flavor, organic extra virgin olive oil. It makes a difference in the dishes that you prepare. If you want great flavor, I encourage you to use, great ingredients. 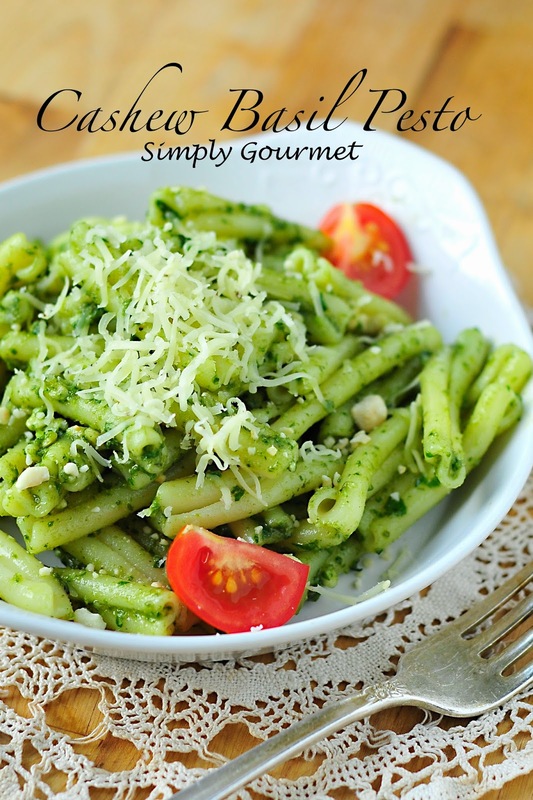 Give this pesto a try and let me know what you think. 1. I use my Vitamix to make this. I add the first 5 ingredients and pulse until blended. You can also use a food processor too. 2. I then pour the pesto into a small bowl and add the parmesan cheese and boiling water. Mix together. Add more water if you would like it to be thinner. 3. Keeps in the refrigerator for 10 days. It never last that long in our family though.